Who Are You Letting into Your Home (Or Client’s Home)? I’ve interviewed hundreds of people over my 15 years owning a pet care business and to be honest, my gut helped me rule out many before I would trust them in my client’s homes, let alone with an animal. However, there have been many that make the cut but relying on my gut for trust, is not wise. Background checks have become a relatively standard practice in the pet care industry, but they are not a requirement and frankly, more companies should be providing them. The app listing sites claim that they do and I have signed up for some to do my own research, they do in fact run a very basic check, but when it comes to who you hire to care for your pets or your client’s pets, the quality of the background check company MATTERS! I’ll admit, I’m a sucker for a good name with great branding. Hence I connected with ProPet Software to share an amazing kennel, boarding and daycare software with our pet care business followers. I was lured in by the name of Chris White’s company PetProCheck, but after I got off our first phone call with him, I knew I had struck a wealth of knowledge that will further my mission of making the pet care industry safer. As the product manager for ProPetHero, our online pet first aid & CPR course, I am passionate about making certain the pets in people’s care are safe, it’s what I wake up thinking about and go to bed dreaming about. I am also exceedingly passionate about making and keeping the world of professional pet care – professional. Apps have made it easy for anyone to just become a pet sitter and while yes, the neighbor can certainly check on your cat or dog while you are away but if they are not trained to recognize an issue, handle a veterinary emergency or have a criminal background, are they really worth the risk? A professional literally means, “a person engaged or qualified in a profession.” Someone that has no training or worse, a criminal history is not what I would consider a professional. So it is in Chris White’s company name, short for Pet Professional Check, but who wants to type in a long URL? Chris may state in the beginning of our interview that his background check process isn’t really that different than others on the market but as he opens up and starts to really compare what’s out there to what he has brought to the market, and most importantly his ‘why’, you learn that he offers so much more. Depending on the package level you chose you can get greater details and longer histories than what’s typically offered. The greatest takeaway that I learned from what sets Chris apart from the other providers is he not just going to charge you and produce a report. Chris will provide information and knowledge to make certain you are compliant with what you receive. 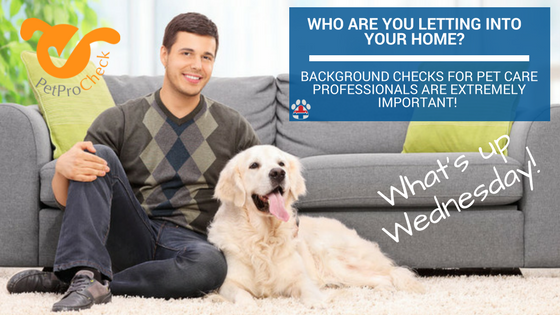 Background checks reveal information that most would like to keep private and there are laws surrounding what you can do with what you have. Chris makes certain you have that information. PetProCheck also has some wonderful marketing benefits too. Not only can you display the badge on your site to show your clients the length you have gone to make certain the people you hire are vetted, but Chris will actually run a Facebook ad in your service town to let potential (and current) clients know that you have gone the extra mile to vet your staff. He’s incredible with the level of attention and care he gives for something that can be a little overwhelming. What information can you collect, what can you reveal and what can you do with it? Chris answers all of that for you AND markets your business, all for the price of a couple of walks or one pet sit. Listen to our Facebook live post to gain more insight into the importance of a good background check and why having someone on the inside of the pet industry build a company to run them right means a heck of a lot. I want to thank Chris from the perspective of a pet care provider and as a representative of ProPetHero. As he puts it, pet professional background checks allow pet care companies to grow responsibly. With the explosion of the pet industry, it’s important to remember that at the end of the day, animals lives are in strangers’ hands. It’s the obligation of the pet care business owner to send safe people into homes or handling pets at kennel/boarding/daycare centers and PetProCheck helps to make that possible.